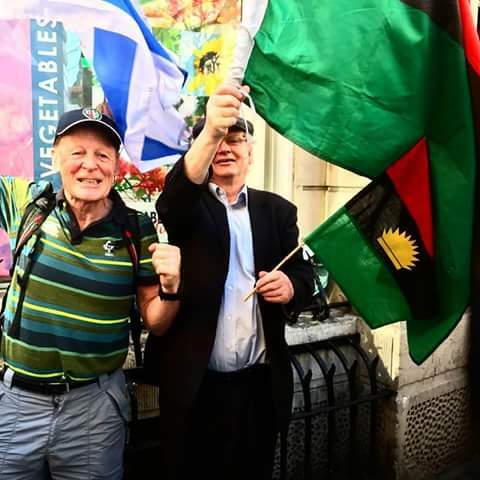 President Muhammadu Buhari was today embarrassed by Biafran protesters before the Queen of England. 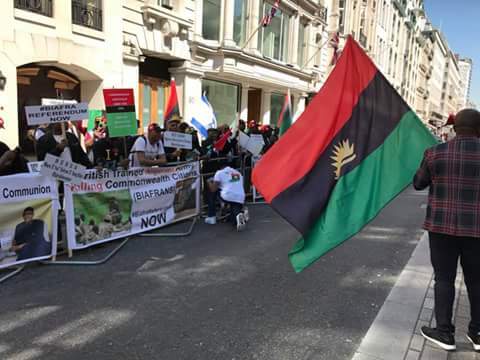 The Biafran activists staged a protest at the Pall Mall Street, Westminster, a few metres from Buckingham Palace, as President Muhammadu Buhari meet Queen Elizabeth II and other heads of state, accusing Buhari of masterminding the massacre of Biafran activists in Nigeria. It would be recalled that Buhari while speaking at the Commonwealth Business Forum in Westminster, was quoted as saying that most youths prefer to do nothing because they feel Nigeria is an oil-rich. 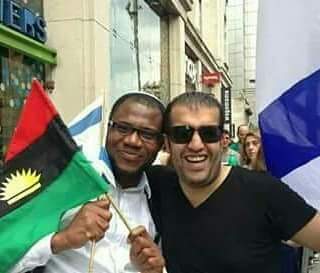 The protesters are requesting the release of Nnamdi Kanu, the leader of the Indigenous People of Biafra (IPOB) and a referendum on the fate of Biafra.